Soo, I wanted to see if it was possible to play big video files (over 4 GB in size) on the Playstation 3. This, however, didn't really work out. The PS3 won't recognise any drive that's connected to it, if it is formatted with NTFS. It will recognise FAT32 though. For those who don't know, the maximum size of a file on a FAT32 drive can only be 4 GB. That file size limit is way too small for these days, where we have 1080p in most devices. To watch that file, I would have to split the file into chunks that are under 4 GB in size. That's only time consuming, diminishes quality and annoying. Thankfully, there is a way to watch and view your pictures and movies on your Playstation 3 with the help of a computer and some software! Works with Linux/Mac OS and Windows! 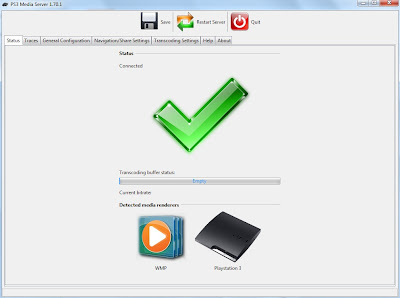 Download the PS3 Media Server software and install it. You will also need Avisynth for transcoding. Have your PS3 ON and connected to your internet. Start the PS3 Media Server program. Now, in most cases it will AUTOMATICALLY find your PS3. Now you can turn your monitor off and head off to your PS3. Either go to Pictures or Videos and you should see "PS3 Media Server [Username]"
Go on that and it will show you the folder(s) you shared and you can watch any video file in them! Your computer transcodes these videos and sends them over the local net to your Playstation. Neat! This is so cool and useful man, thanks very much for sharing this informative guide, I bet that this is going to end up helping a whole lot of people get around this issue.